August 10, 2014 in Articles, Personal Stories. 25 years ago I was trying to write a research methodology text book but was unable to so due to severe writers block. This was making the lives of my friends in Glasgow a misery. One day someone suggested that I go to a quiet place and complete the book and then return and behave as a normal human being again. A few days later I found myself in a Tibetan monastery called Samye Ling in the borders of Scotland. Here I managed to complete the section of the book I was responsible for (it was a collaboration) the book is entitled Management Research and was eventually published by Sage publications in 1990. The day after I managed to complete writing the book I rewarded myself with a walk in the forest adjacent to the Samye Ling monastery. It was here that had my first encounter with a Tibetan Lama who I was later came to know as Ringu Tulku Rinpoche. Dressed in the maroon robes of a Tibetan monk he easily stood out in the dark green Scottish forest. He approached me and asked me if I was interested in Buddhism. I replied that I had no interest at all in Buddhism. He then enquired as what I was doing here. My reply was rather direct. I told him that I was here because it was cheap and quiet. I was here because I came to complete writing a book. Rinpoche then asked me if I was famous. When I responded to him in the negative he expressed his disappointment because he said he would very much like to meet someone famous. We walked together for a while and then he invited me to join him in a cup of tea in the cottage next to the monastery where he was staying. I was very impressed by both the pristine nature of his spoken English and his gentle ambiance. I asked him a few questions as what he was doing here. He told me that this was his first visit to Europe and he was living in Sikkim in the Himalayas. He was invited by Akong Rinpoche to give teachings at Samye Ling. Since I was an academic I was very interested to know where he had studied. Amongst the things he told me I discovered that he had a PhD. He had studied for his PhD in India at the university in Varanasi. Rinpoche gave me an open invitation to visit him in Sikkim in August. Having a rather skeptical nature I thanked him for his invitation but told him I had never been to Asia and I had no plans to do so. He said never mind and then presented me with his card. He was a professor at the Institute of Tibetology in Gangtok Sikkim. I thanked him for his conversation and assumed that would be the last I would see of him. How wrong I was. Two months later my boss at the university where I worked in Glasgow asked me to give a series of research seminars in September in Malaysia, Singapore and Hong Kong. I agreed and began planning my first trip to Asia. I decided to extend this trip to also be a holiday. I wanted to see the main tourist sights in India en route to SE Asia. In those days most flights from the UK to South East Asia went via Delhi India. On arrival in Delhi I called Ringu Tulku Rinpoche in Sikkim just to say hello. He then asked me on what date would I be arriving in Sikkim. I told him that it’s unlikely for me travel to Sikkim on this trip because the monsoon was still in full flow. Anyway he repeated his invitation to me. At this point I decided to combine a trip to see the Taj Mahal with a visit to Rinpoche’s old university at Varanasi. I wanted to checkout the academic credentials of Ringu Tulku Rinpoche and find out as much about him as I could. If everything was genuine and authentic then may be I might travel to Sikkim. The people at Varanasi university remembered him as a very good student and confirmed that he was a PhD. I decided to set off for Sikkim. It was a lengthy series of train journeys via Delhi, Calcutta, New Jalpaiguri and Darjeeling. After an overnight stop in the hill town Darjeeling I proceeded by local bus to Gangtok in Sikkim. The scenery in the Himalayas is stunningly beautiful. This is especially so in Sikkim where deep mountain gorges allow, at different altitudes, the simultaneous cultivation of soft fruit, vegetables, wheat, rice and tea which eventually gives way to the massive snow capped Himalayan range. Sikkim is now a semi autonomous state within India which borders Tibet, Bhutan and Nepal. The world’s 3rd highest peak [Kanchenjunga] is within Sikkim borders and towers majestically over everything. On arrival at Gangtok in Sikkim I was met by one of Rinpoche’s brothers Pema. I learnt later than he had some difficulty recognising me from Rinpoche’s own description. This is because Rinpoche had told his brother Pema that I was a “plump” Englishman. In fact on my arrival in Sikkim I had lost several kilos and was wearing local Indian clothes. Pema then took me to the local State Tourist Lodge hotel where I was to stay. The next day I did meet Rinpoche and he invited me to move out of the hotel and stay with him and the rest of his family. I happily agreed and joined Rinpoche, his uncle, his mother and father and his three brothers Salga [the famous thangka artist], Pema and Kalsang. 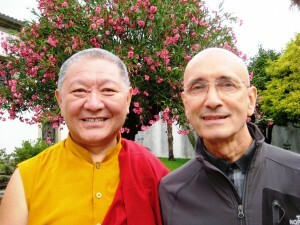 Over the next few days I had several walks with Rinpoche when the subject of Buddhism arose. Although I was brought up in UK to be a Christian I was never really a committed believer. Eventually I suggested to Rinpoche that I perhaps should become a Buddhist. Rinpoche asked me why I wanted to be a Buddhist. I gave him an intellectually reasoned argument as why it would be logically better for me to be Buddhist rather than a Christian. Rinpoche then told me that it was probably more wise for me to remain a Christian since Christianity was also a compassionate belief system. I did not appreciate his answer and over the next few days we had more discussions on this subject. Then I began to understand the reason for Rinpoche’s apparent reluctance recommend that I become a Buddhist. Ever since Rinpoche first met me he was able to see that behind my confident exterior and that I was in the midst of some very traumatic emotional things which were happening in my life. I was being less than candid about my personal situation and until I was able to confront this any personal spiritual development would be limited. Once I opened up to Rinpoche I gradually was able to embrace his compassionate advice and support. When I again asked Rinpoche if I could become a Buddhist he agreed that it might be a good idea after all. But first I should fully understand what it involves and then perhaps I could take refuge. 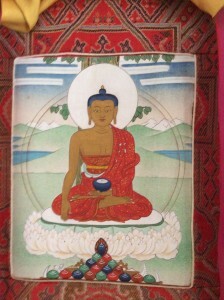 One day Rinpoche asked me where and with whom I would like to refuge. He suggested that he could recommend that I might wish to have a special refuge ceremony with an important teacher in a Rumtek monastery in Sikkim. I thanked him for this suggestion but requested that I would prefer to take refuge with Ringu Tulku Rinpoche. He then agreed but pointed out that he did not have a Monastery in Sikkim and he may not be the best person for me. I again requested Rinpoche to allow me take refuge with him here in Sikkim. Finally an intimate refuge ceremony was held inside Rinpoche’s home in which I was surrounded by members of his family. Rinpoche gave me the name of Karma Senge. His elder brother Salga gave me a gift of a beautiful thangka of Sakaymuni Buddha (which he had just finished painting) to commemorate this day and my new commitment. 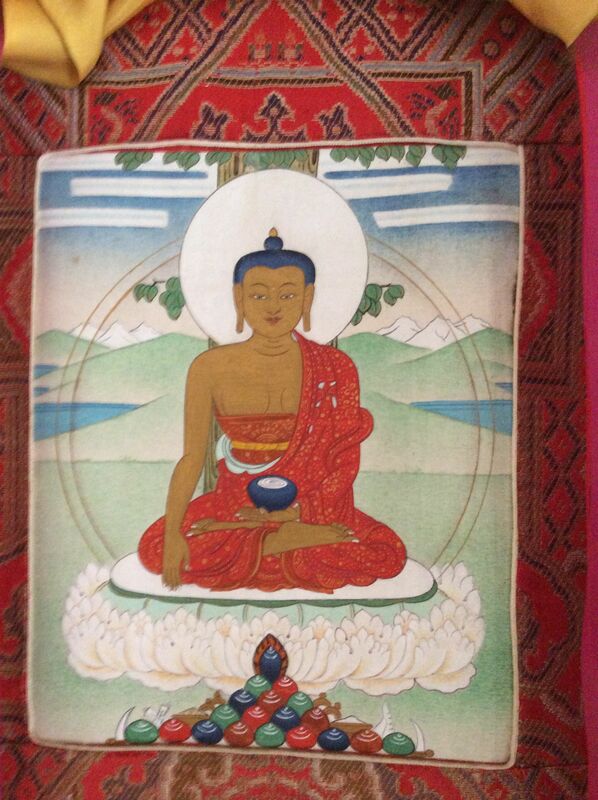 This is a photo of the actual thangka I was given by Ringu Tulku’s brother Salga after the refuge ceremony in Sikkim. Time was running out and my stay in Sikkim had only a week to run before I had to start my work in Singapore. Before I left Sikkim Rinpoche suggested that I might do a short pilgrimage to some sacred places in the mountains of Sikkim. I was able to do this short pilgrimage – but that is another story. Andy, for the past 15 years has been resident in Bangkok Thailand living as a non-immigrant resident alien retired. He is devoted student of Ringu Tulku Rinpoche and in Bangkok he teaches meditation in a non-sectarian Buddhist group comprising of Theravadan, Zen and Tibetan Buddhist practitioners. Although Andy is retired he is a visiting professor at academic Institutions in Denmark, the Philippines and California where his expertise as Grounded Theory practitioner is appreciated. ps Hope to see you next year at summer camp – I couldn’t come this year because of a back injury.